What is a Creation Myth ? Introduction. 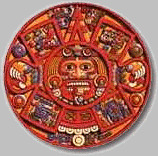 As our early ancestors studied the world around them they began to tell stories to try to explain the natural phenomena they observed, and to make sense to such things as life and death, the changing seasons, natural disasters etc.. The stories differed greatly from place to place and from time to time, and were largely influenced by the natural environment that people found themselves in, the animals they hunted, and so on. As part of our study of ancient peoples, my Grade 6 class decided to make an investigation into some of the creation myths and legends from their own cultures which have been passed down from generation to generation. Here are their stories. You can read about our project and more in the March '99 edition of Exploring Literacy on the Internet from Reading Online. Online exhibition inspired by Joseph Campbell's story of the "hero's journey" hosted by Smithsonian National Air and Space Museum. Many of the images in this collection from the Minneapolis Institute of Arts represent myths that explain a practice, belief, institution, or natural phenomenon. The Yoruba king's crown, the Roman furniture decoration, and the abstract designs on the Navajo ketoh and the Lakota dress refer to creation stories. This is an encyclopedia on mythology, folklore, and legend. It contains numerous definitions of gods and goddesses, supernatural beings and legendary creatures from all over the world. A traditional Indonesian folk tale from students at Fahan Junior School in Tasmania. Here visitors will find similar projects from other schools including The Legend of the city of Surabaya . Student project 1995 from Princeton High School (US). Collection of creation and origin stories from Bob Smith and Mary Lancaster in Australia. Creation myths, origin stories and animal legends from Canada, Australia, Iceland and Israel. Tale of how the elements of water, wind and fire learned to live together retold and illustrated by Linda Hastings. Here is a legend from Brazil about why the "night" was first created. Several excellent stories including Apache creation story and from the Iroquois people "How Fire Came To The Six Nations" . Norse tale of creation of the world from part of large site on Norse Mythology. A large site which divides the subject into three categories: pure myth (primitive science and primitive religion), heroic saga (primitive history), and folklore (fictional stories). There is a section on Creation and Flood Myths.